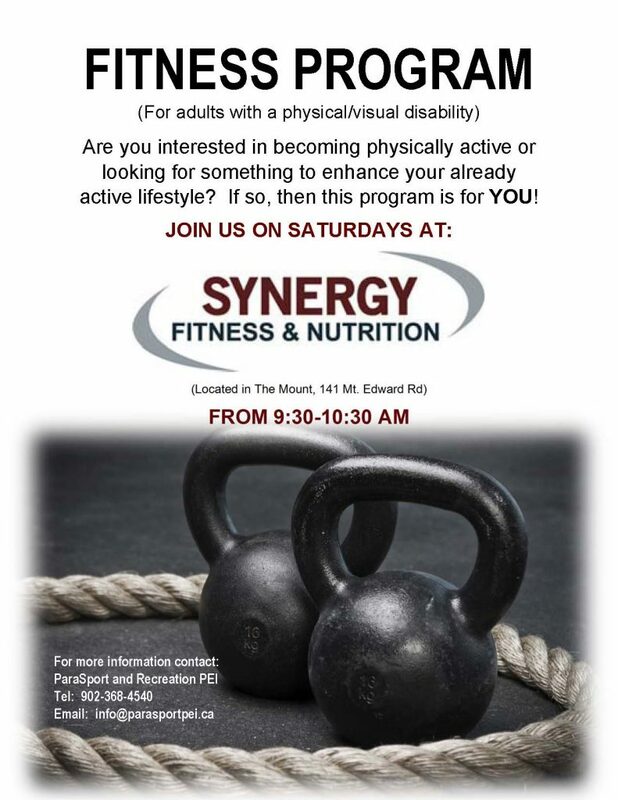 ParaSport and Recreation PEI has teamed with one of their local sponsors, Synergy Fitness and Nutrition to offer a new fitness program for adults with a physical or visual disability. The program includes both cardio and strength training exercises and will be offered from November 2017 through to May 2018. This program is open to anyone regardless of fitness level from those to have never been to a gym before to the every day gym enthusiast! It will be adjusted for your personal needs and goals and will change every 4 weeks to give you a little extra challenge! The program is offered every Saturday morning from 9:30-10:30 AM at Synergy Fitness and Nutrition located in The Mount. The registration fee is $50.00. To learn more about the program or to register, please contact the ParaSport and Recreation PEI office.